The first three or four bites of these Crisps featured a very firm, crispy and crackling snappy crunch. They then turned mushy quite quickly. Unlike standard Crisps that almost always feature a paced deterioration, however fast or slow, these began crispy and then turned pulpy. There was an almost free dried look about these Crisps. They looked like a dry and moisture sucked Crisp. There were oil boil looking bums. There was skin on most edges. There was also a pale whitish yellow colouring that also enjoyed the benefit of red and green spots of seasoning all over the Crisps. A Nose Plunge Test revealed a feint hint of Sweet Chilli, similar but not quite as strong as with most Sweet Chilli Crisps. The taste was similar. 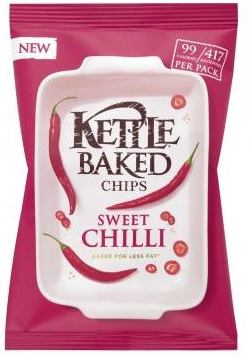 There was a very feint taste of Sweet Chilli mixed in with a slightly burned potato sort of flavour.